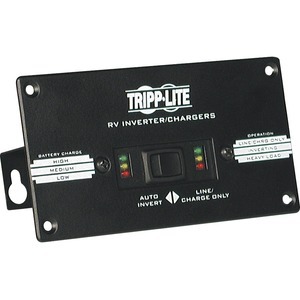 The APSRM4 Remote Control Module lets you monitor and control your Tripp Lite PowerVerter inverter (PV-Series) or inverter/charger (RV-, APS- and EMS-Series) from up to 50 feet away. Ideal for automotive, remote site, industrial, commercial and residential applications, the APSRM4 mounts easily in a variety of locations and configurations, including below a dashboard, so you can control your inverter or inverter/charger from the comfort of your vehicle.Monitor battery charge level and the connected inverter's mode at a glance via the front-panel LEDs. The compact, heavy-duty all-metal housing also includes a convenient switch that lets you toggle between inverter and charger modes. A master override port enables automatic shutdown under various conditions, such as when the vehicle's ignition is on or off, the battery is disconnected or water is encroaching.Built-in mounting slots and a 50-foot cable provide plenty of flexibility in mounting and operating the APSRM4. You can even daisy-chain multiple units to connect to a single inverter or inverter/charger. A faceplate is included for front-panel mounting in an RV, boat or other vehicle.